The Vedas are the most important record of the religion and the institutions of the Aryans. The last and the latest Veda is the Atharvaveda. This Veda is not included in the Trayividya, which proves its late origin. 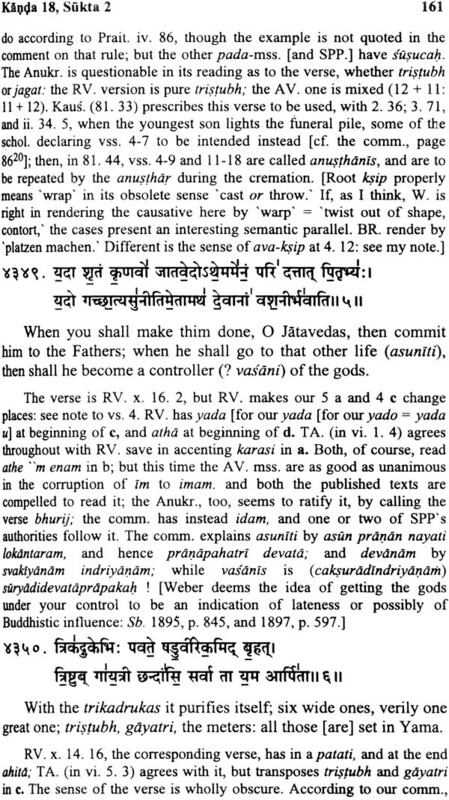 Alike every division or segment of Veda, Atharvaveda has its some characteristic on the basis of which a number of Veda learned persons consider it unique. The branches of the Vedas have their own particular directions but when we talk of Atharva Veda, it appears as it has embedded the corpus of life with all meanings in its ambit. The most cryptic mysteries of universe, the divine prays, applications of offerings (Yajniya), cure for the ailments, marriage, reproduction, family, social pattern and self- protection etc. all aspects of the universe and the human life are embedded with it. Pure science with the cryptic knowledge is include with others streams of Veda. But simultaneous to cryptic streams of the knowledge and science, Atharvaveda is an applied science too. Out of the four Rtvija (performer of the offering as suggested by the Rsis for executing perfectly the offering ceremonies with an objective to make the life of pleasure and free from the pains and sorrows; the principal Rtvija Brahma is directly related to this very Veda. The place of Brahma among the Rtvijs of Council of offering is at the top. i.e. he is chairperson. The responsibility assigned to Brahma is to supervise the methods of offerings and rectify the errors. He can only handle such particular liability when all Vedas are well learnt to him. He should also possess a strong will power too. It has been stated in Gopatha Brahmana at 1.3.2 that – “Only a part of offering is processed by application of the three Vedas. The second part of it, is processed by Brahma through the application of mind or mental power. Aitareya Bra. (5.33) declares that there are two routes for executing the offering – first is Vak (speech) and the other is mind. 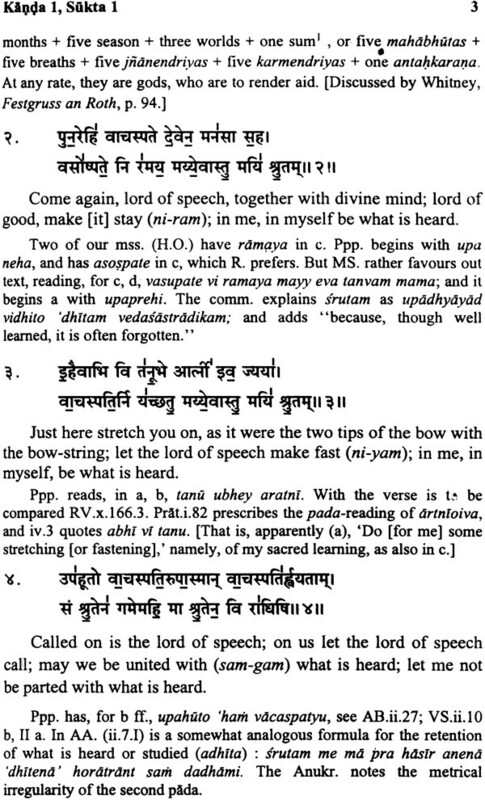 Three Vedas (Rk, Yaju, Sama) processes one part of offering through the speech and the other part is processed by Brahma through Brahmaveda (Atharvaveda) applied through the mind. This Veda mainly contains mantras used in which – craft or sorcery, in the curing of diseases, for destruction of enemies etc. Actually, Atharvaveda describes the application of both type of ceremonies viz. Peaceful affirmation and the witchcraft (Abhicarika) ceremonies. A particular importance of such application has been accepted for the king. The king requires performing the Santika – Paustika deeds and Tulapurusa Mahadana etc…The priest should be expert in application of Atharva hymn and Brahmana. It has been mentioned in Atharvaparisista that the nation where resides the priest, expert in Santikarma and well learned to Atharvaveda, attains accession – to without any fear of invasions and disturbances. “Hence, it is necessary for a king that he should honour daily with pray, donation and respect to the priest well learned to Atharvaveda and commander of his sensory organs. Perhaps a certain number of Acaryas have accepted it as the first Veda on the premise of this very significance that Atharvaveda holds. Jayant Bhatta in his Nyaya Manjari (Page 237 – 38) has accepted it as the first Veda among the total four Vedas. Nagara Khanda to submit while accepting is as the first Veda – “As Atharva is mainly used for the accomplishments of all worldly acts; it is called as the first Veda. As it is fruitful for this material world, it would have perhaps due to this reason, called the first Veda. The other three Vedas, having their metaphysical blessings and fruits, they come in the second number, while writing the Introduction of Atharvaveda composed by him, Acarya Sayana observes in the introduction of this Veda that the three earlier Vedas are for spiritual ends while the fourth and last Atharvaveda is for both worldly and higher purpose. The Vedic literature, Atharvaveda is addressed with a number of names such as – Atharva Veda. Amrta Veda. Atmaveda. 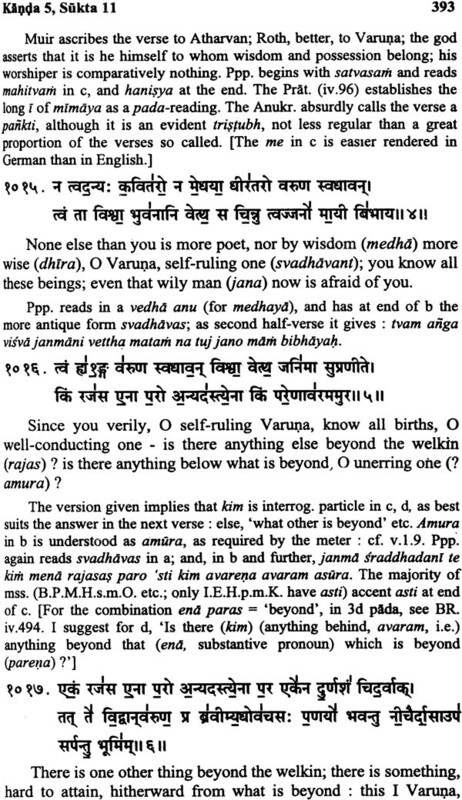 Amgiro Veda, Atharvangirasa, Bhrgvangirasa, Ksatra, Bhaisajya and Chando – Veda etc. The Atharvaveda presents its own name as Atharvangirasah along with names of other Vedas. While interpreting the term “Atharva” Nirukta of Yaska at 11.2.18 states – “Tharva” root is applied in the meaning of rudeness, curvey, dynamically, violence etc. Hence, the term “Atharva” is meant by attainment of the stability of mind with exercising modesty and non – violence. It leads to the conclusion that its negation must necessarily mean one who is deprived of movement; that is to say a stable being. Atharvaveda is also addressed as Brahma Veda. Actually, this Veda is determined for the use of Brahma, the chairperson of offering Council (Yajna Samsada). 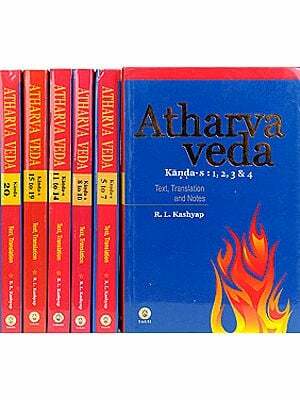 It has been prescribed that Brahma should be well learned with four Vedas but outstanding knowledge in Atharvaveda is unavoidable for him as Brahmaveda contains all that which is separately found in four Vedas. On account of the priority of the Brahmakarma of Brahma, it is construed as Brahma Veda. Atharvaveda has been addressed as Brahmaveda in Gopatha Brahmana, Chandogya upanisad etc. scriptures too. 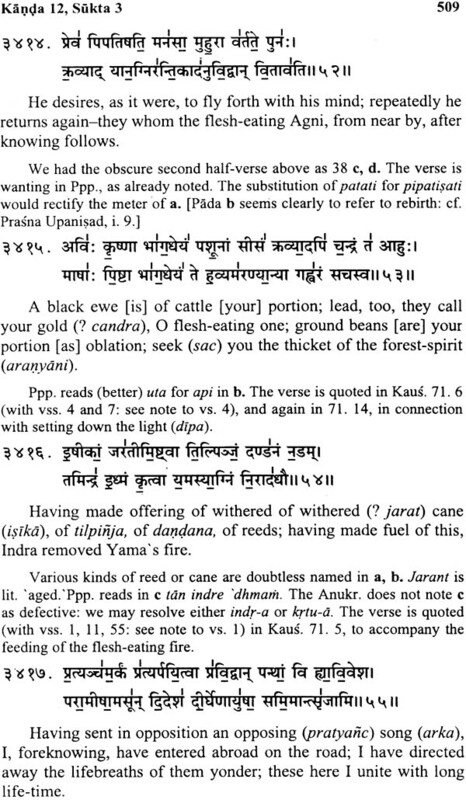 The most ancient name of Atharva is Atharvangirasa Veda too. This composite word seems containing the two words i.e. “Atharva” and “Angira”, two clans of Rsis. As the sage Atharvan born in the family of Angira had given this Veda in the present form, it is called Atharvangirasa Veda. One more thing to be noted is that the hymns of Atharvan are with the deeds of peace and confirmation and the hymns of Angiras are witchcraft (Abhicarikak). As the peace and confirmation hymns fall first and only than the witchcraft hymns come, the name of this Veda as Atharvangirasa (Atharva + Angirasa) is therefore, outright. Here Bloomfield states the distinction between said two sets. He says that Atharvana mantras are for the good purposes while Angirasa mantras are for the evil. 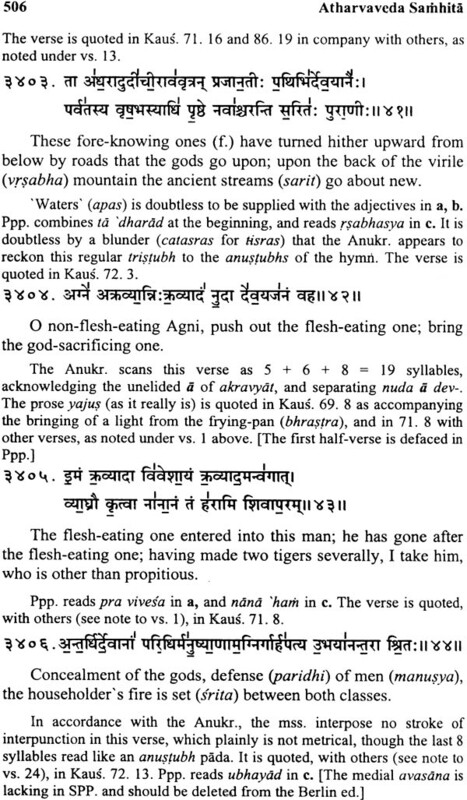 Atharvaveda is also addressed as “Bhrgvangirasa Veda” too. This appellation seems to bring out the importance of two priests Bhrgu and Angirasa. Bhrgu was the disciple of Angira. The Rsi Bhrgu had played an active role in propagation and publicity of Atharva Veda. It was therefore, addressed as Bhrgvangirasa Veda and the supremacy among all. In addition to the appellation mentioned above some more names are also given to the Atharva Veda. This appellation is perhaps unknown to many Vedic scholars. 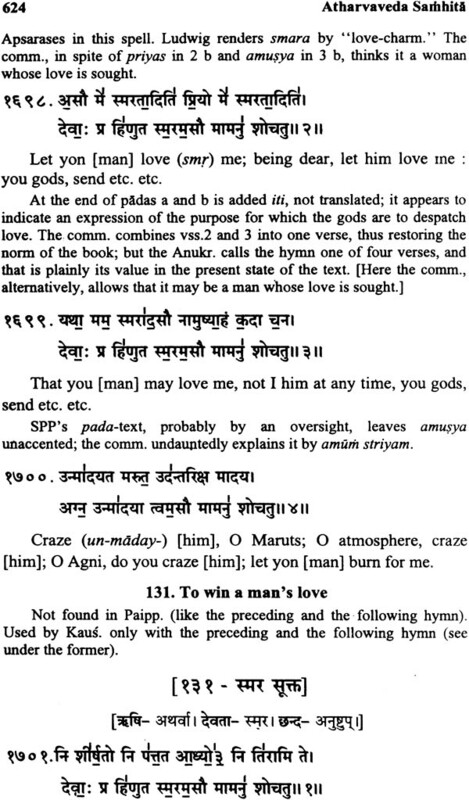 Atharva itself shows this in the text. In Chandamsi – Atharva. 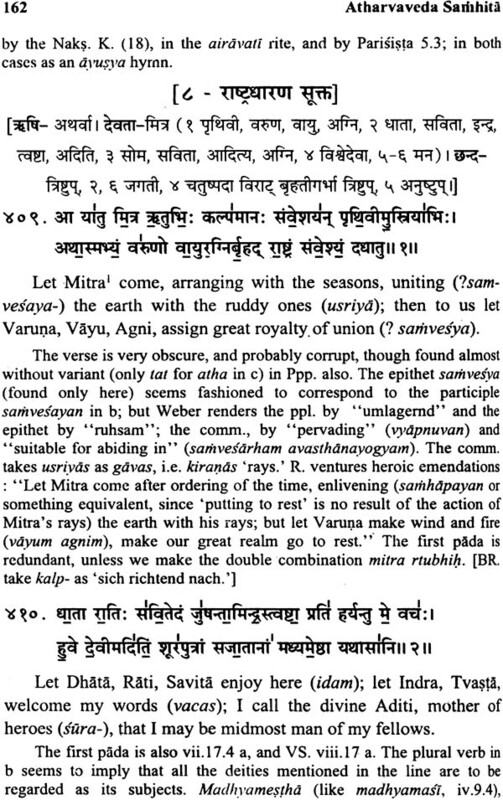 11.7.24 it is addressed as Chandoveda and Rcah Sama Yajurmahi – Atharva. 10.7.14, as Mahiveda. In Sata. Bra. 14.8.14, as Ksatra Veda and in Atharva, 11.6.14, it is addressed as Bhaisajya Veda. All these names of Atharva Veda, make very clear the wide enunciated topics of it, but here a significant question arises, why only the name ‘Atharvaveda’ came into vogue? 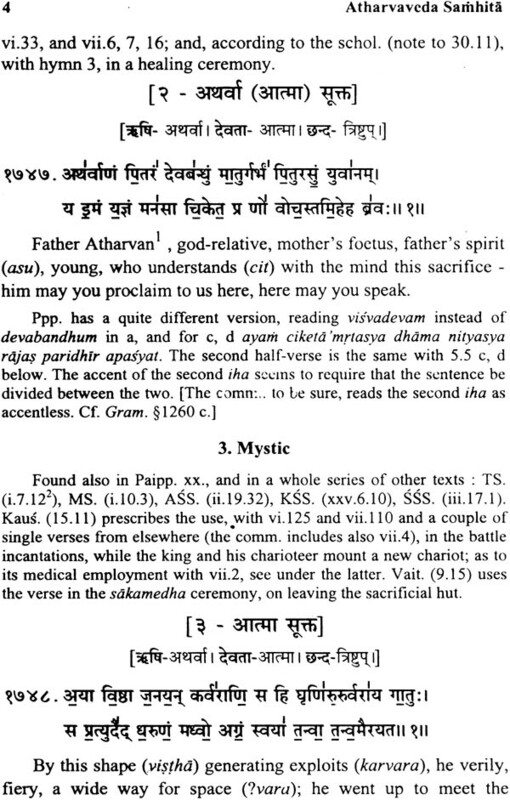 Here Dr. Karmabelkar gives the scholarly statement that “This title is abbreviated form of the oldest and original title ‘Atharvangirasah’ which with probability, not only includes the names of the two ancient mythical sages but also represents their very characteristic representations and contributions. In the later period, the name to be known as ‘Atharvangirasah’ an finally this title was shortened into the convenient and handy title ‘The Atharvaveda’. 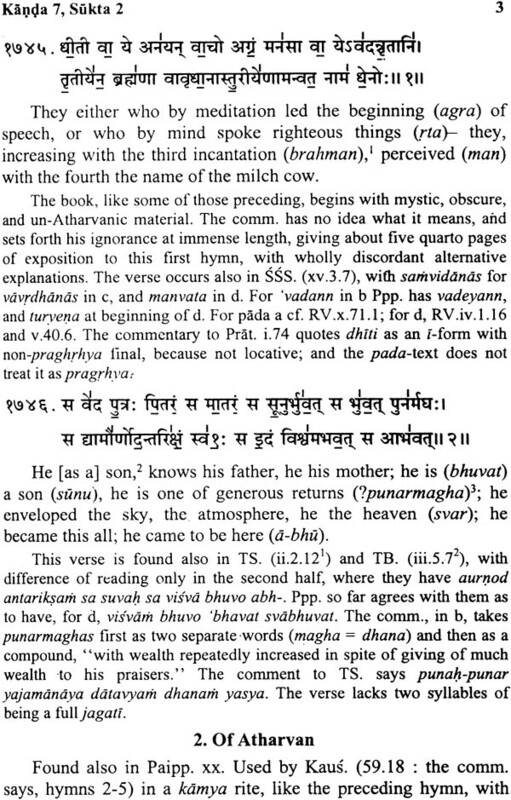 Of course, the name Atharvan, Angirasa and Bhrgu also occur in the Rgveda many times but there they designate only some mythic personages, nowhere do they refer to any kind of literary composition. In the period of the Brahmana literature the position of the Atharva appears to have swung in a bewildering manner, for sometimes it is referred to while at other times it is neglected. At one place Satapatha Bra. Omits the name of this Veda, but at some places this text speaks for this Veda by its very name Besides this, some of the Srautasutras also mention the name of this Veda. Many scholars of Vedic literature like Macdonell, Bloomfield etc. categorised the hymns of Atharvaveda in different classes as the hymns are meant to secure long life (Ayusya – suktani), to get good wishes of the deities in many household manner (Pustikani), to ward off misfortune (Mrgara suktani), to pardon the misdeeds (Prayascittani – suktani), to obtain the kingship (Rajakarmanisuktani), as well as Abhicarikani suktani and Bhaisajya suktani are classified with their subject matter. 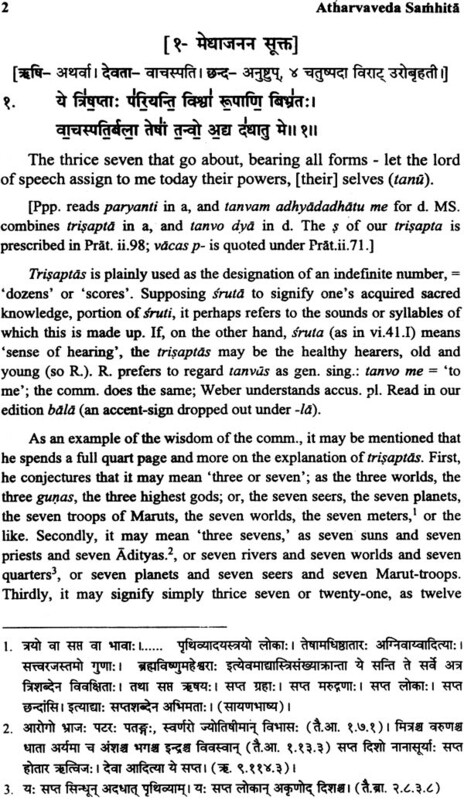 Besides all these, a class of hymns of cosmogonic and theosophic category occupies a good place in the Atharva – Veda. The subject matter of these mantras is Brahmavidya character of Rohita (Cosmogonic power), Kala (time) Prana and Kama (love). Kala is described such as an important personality as the creator, controller of the heaven, midsky and earth. 1. Pakayajna, 2. Medhajanana, 3. Brahmacarya Siddhi, 4. Promotion of villages and cities, 5. Prosperity of son, wife, subjects and animals etc. 6. Harmony – spirit of unity, 7. Ruling (Raja karma), 8. Satru Sadana, 9. Victory in war, 10. Seizure of weapons, 11. Dazzling of army (Sainya Stambhana), 12. Protection of Army (Sainya Pariraksana) 13. Concept of Victory and Defeat, 14. Deeds of Army commanders etc., 15. Policy of spying Army (Sainya Bhedaniti), 16. Reinstatement of King (Reestablishment) 17. Deed of regret, 18. Promotion of agriculture etc., 19. Accession to family, 20. Pharmaceuticaldeed, 21. Ceremony, 22. Conference – means of victory, 23. Vrst I – Prayoga. 24. Deeds for accession to (Abhyudaya Karma), 25. Commercial activities, 26. Discharge off debt, 27. Abhicara Nivarana, 28. Ayusya Karma and 29. Offering ceremonies. 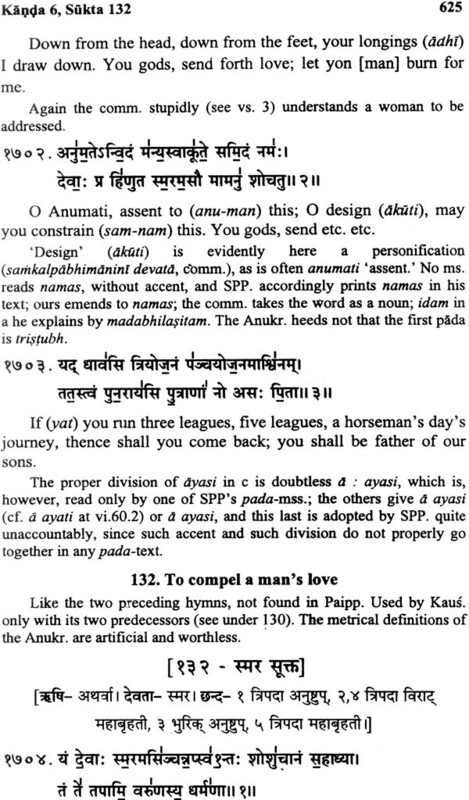 The Atharvaveda Samhita has been divided in two sections – 1. Kandas, Suktas and hymns and 2. Kandas, Anuvakas. Prapathakas, Suktas and hymns. The entire subject matte on. Atharvaveda is arranged in twenty Kandas. A division of Kandas, Sukta and hymn only appears easy and universally accepted. It seems that the second section has been made for the convenient recitals as it incorporates Anuvaka, Prapathaka, Sukta and hymns. It is not so popular today and not so convenient. 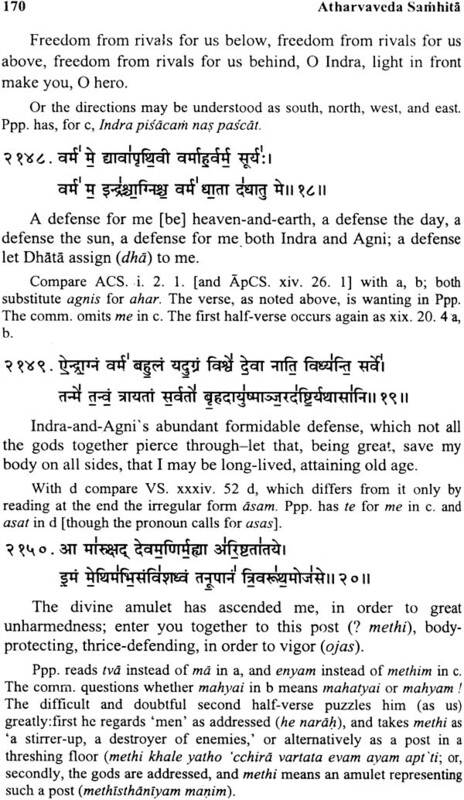 The Atharvaveda can be divided in four parts from the angle of composition. (i) First division – (from 1 to 7 Kandas) – There are small Suktas in this section. In every sukta of first Kandas, there are 4 hymns, 5 hymns in second, 6 hymns in third Kandas, 7 hymns in fourth Kanda and 8 hymns in fifth Kandas. A majority of Suktas in seventh Kanda have only one or two hymns. Prthvi Sukta is existed at the beginning of twelfth Kanda. There are 63 hymns and the geographical sites and political principles have been described herein. (iii) Third division (from 13 to 18 Kandas) – Uniformity in subjects lies in all suktas in each Kanda of this part. 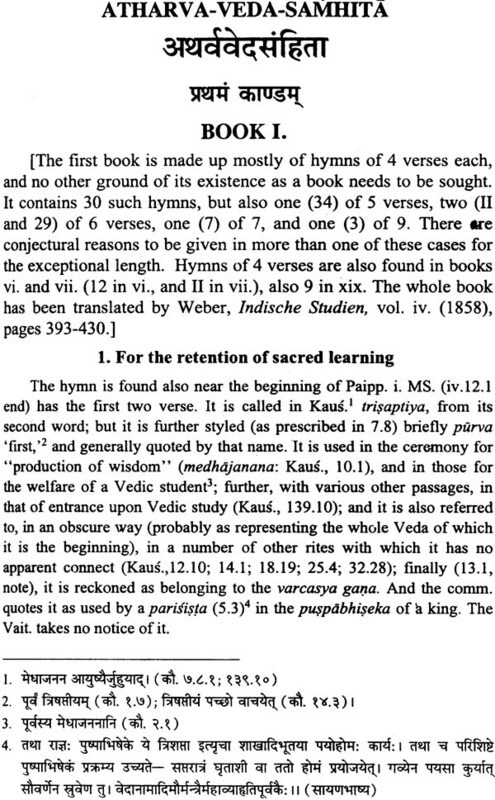 There are hymns related to metaphysics in thirteenth Kanda. The fourteenth Kanda bears hymn related to the marriage. There are metaphysical hymns relating to the offerings of Vratyas in fifteenth Kanda. The sixteenth Kanda bears hymns of removing the nightmares. The seventeenth Kanda a sukta and thirty hymns in which Sammohana hymns (Enchanting hymns) is also existed. There are hymns relating to funeral and offering for the appeasement of incestors in eighteenth Kanda. (iv) Forth Part (19 to 20 Kandas) – The nineteenth Kanda contains the hymns relating to cure, medicine, growth of the nation and metaphysics. The twentieth Kanda bears the hymns relating to Soma – yoga. 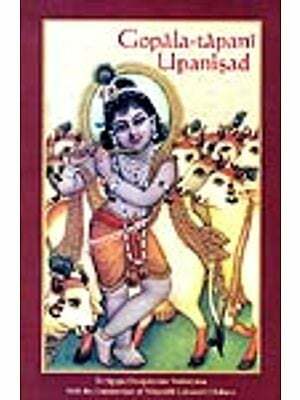 A majority of hymns are from Rgveda or have nexus with the hymns of Rgveda. (i) Pharmaceutical viz. proposition of the medicines for relieving the ailments, (ii) Immortality viz. laying down the means that can keep the death at bay (iii) Brahman, viz. laying down the supreme knowledge. (see Go. Bra. 1.3.4). The author of Atharva Parisista has stated in a single sentence while enunciating the magnificence of the hymns in Atharva Veda – “All industry will achieve success with the due knowledge of hymns in Atharva Veda”. The descriptive topics: The scope of topics worth description is very wide. Acarya Sayana has divided it into fourteenth sections. Later on, a statement of 29 topics is found in the list framed by the scholars who were gone in depth. These are the main topics as laid down in Atharva Veda. These can further divided in sub – divisions, sections and thus, the number may be increased more. Having gone over the entire subject – matter of Atharva Veda, it can be concluded that this Veda embeds within its ambit, the styles of living perfect life, effacing the hurdles with keys of a peaceful, successful and prosperous formulae of life. 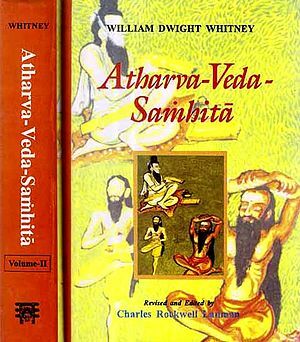 In Darila Bhasya of Kausika Sutras in Atharva Veda, three Samhitas of Atharvaveda have been described, while other three Vedas has one Samhita each as presently available. The three Samhitas enunciated in Darila Bhasya for Atharva are – (i) Arsi Samhita (ii) Acarya Samhita and (iii) Vidhi Prayoga Samhita. Arsi Samhita is a compilation of hymns received by the seers traditionally from one generation to another is called Arsi Samhita. 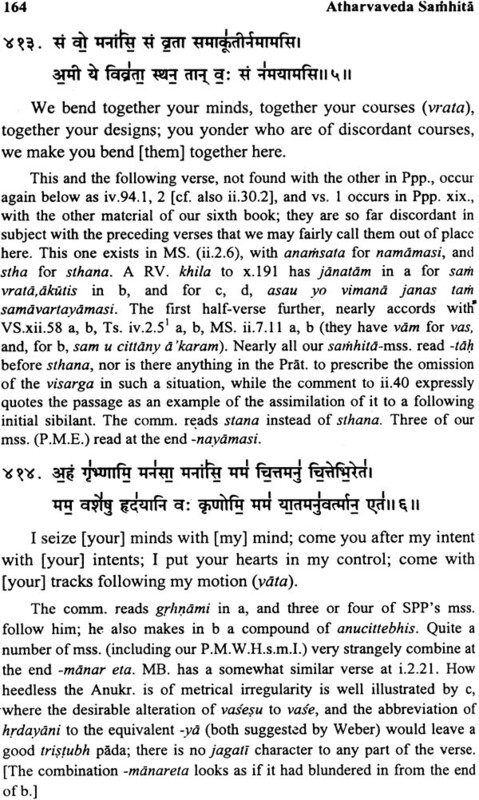 The Atharvaveda as available presently duly divided in Kandas, Suktas and hymns addressed as Saunakiya Samhita is actually Rsi Samhita or Arsi Samhita. Acarya Samhita -It has been stated in Darila Bhasya about this Samhita that the teaching from of Acarya applied for his disciple after Upanayana ceremony (Sacrificial thread ceremony) is called as Acarya Samhita. Vidhi Prayoga Samhita - When the hymns are applied for any deed under ceremony, one hymn is divided in several Padas and the ceremonial hymns is formed. The compilation of such hymns is called Vidhi Prayoga Samhita. It is the first type of Vidhi Prayoga Samhita. Similarly, it has four more types also…In the second type, new words are added with hymns. In the third type, the frequency of any particular hymn is made with the counter hymn of that Sukta. Thus, the number of hymns of Sukta is doubled. In the fourth type. This order of hymns arranged in any Sukta is changed/altered. In the fifth type, the half part of any hymn is applied as treating it complete hymn. It can be concluded now that Arsi Samhita is the basic Samhita. Acarya Samhita is its abridged form or compendium and Vidhi Prayoga Samhita is its expanded form. Atharvaveda has more than one branches like other Vedas. 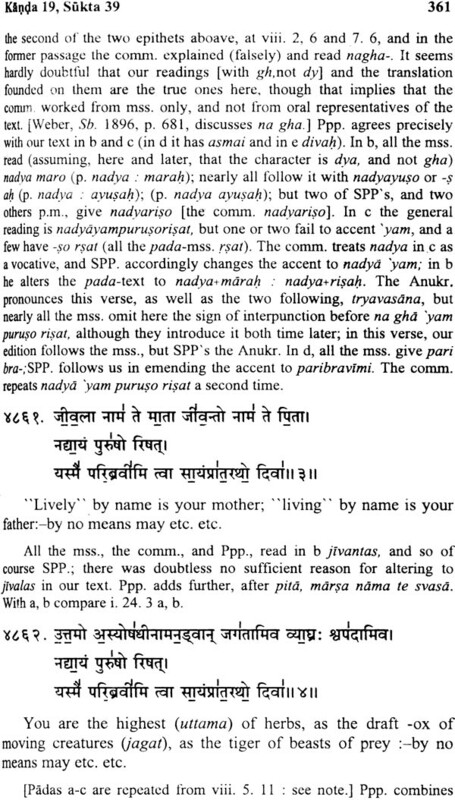 The branches of Atharvaveda have been mentioned in introduction of Sayana Bhasya Prapanca Hrdaya, Carana Vyuha of Vyasa and Mahabhasya of Patanjali. The renowned seer Patanjali has stated nine branches of Atharvaveda in his Mahabhasya. 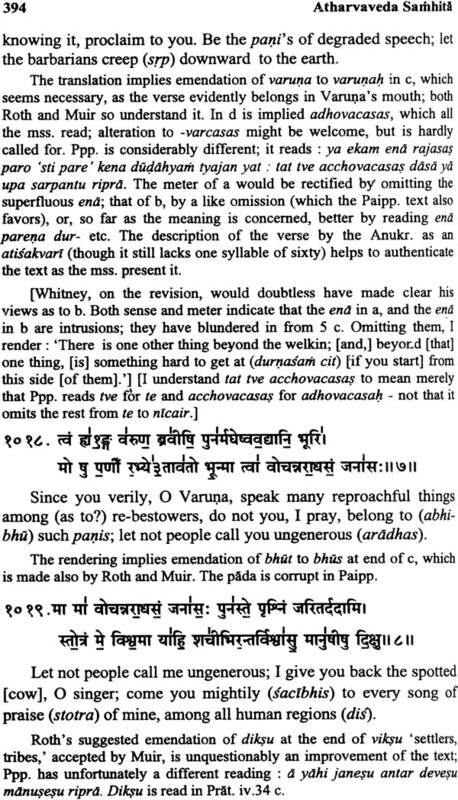 Two opinions have been extracted in this regard in Sarvanukramani or seer Katyayana. 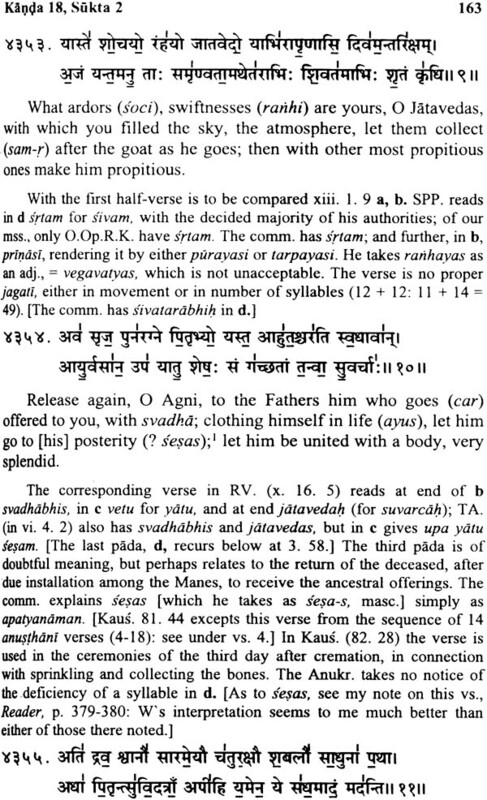 As per first opinion, Atharvaveda has fifteen branches. A scripture “Carana Vyuha” stating the authoritative description of the branches of Vedas, as much as nine branches have been accepted. These are – 1. Paippala 2. Danta 3. Pradanta 4. Snata, 5. Saula, 6. Brahmadabala, 7. Saunaka, 8. Devadarsata and 9. Carana – vidya. 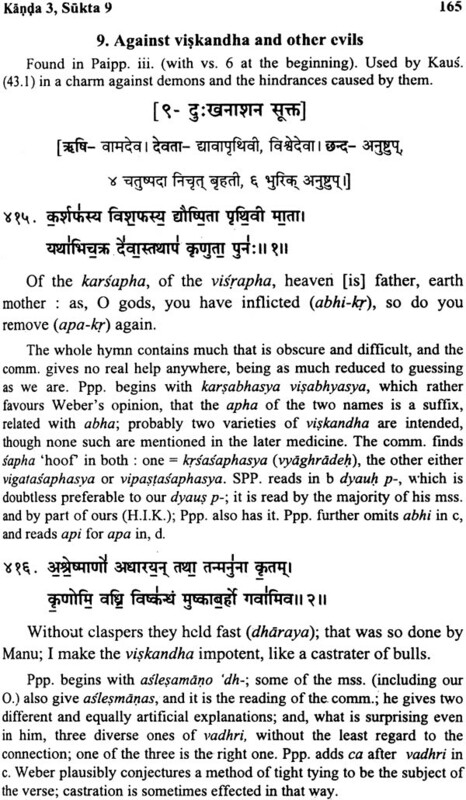 Acarya Sayana too has accepted its nine branches in his Atharvaveda Bhasya Bhumika but their names are distinct than as stated in “Carana Vyuha”. A majority of scholars have considered as authoritative, the names as stated by Sayana. These are – 1. Paippalada 2. Tauda, 3. Mauda, 4. Majority of scholars have considered as authoritative, the names as stated by Sayana. These are – 1. Paippalada 2. Tauda, 3. Mauda, 4. Saunakiya, 5. Jajala, 6. Jalada, 7. Brahmavada, 8. Devadarsin and 9. Carana Vaidya. Thus, as much as nine branches of Atharvaveda are popular but a Samhita related to two branches is only available at present. The seven other Samhitas are not available. Out of these two branches as available, only Saunaka Samhita is the presently prevailing Samhita. The other Samhita i.e. Paippalada Samhita is only available in any library merely to see but not for study. Thus, the really available and prevalent Samhita is Saunaka Samhita. Svami Gangesvarananda has specially contributed for providing dynamicity to the tradition of Vedic study He has published four Vedas in a single volume. 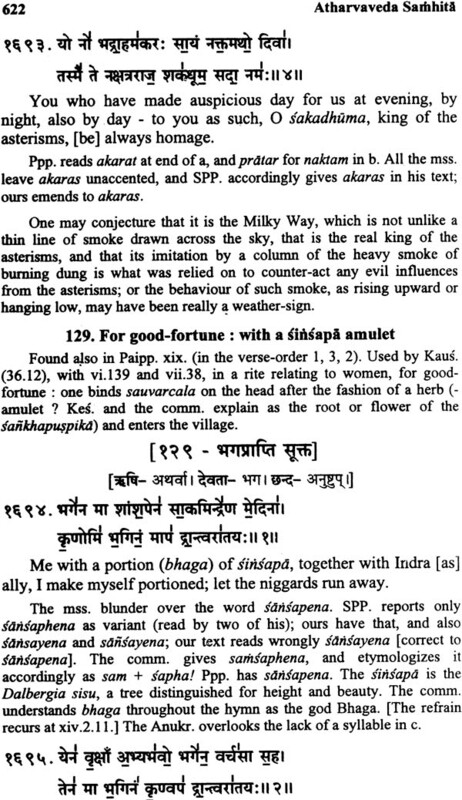 The Atharvaveda so complied by him contains 736 suktas. An appropriate analysis of these all Samhitas goes in favour of treating it as containing total 759 Suktas. It has been confirmed in Brhatsarvanukrmani, and the Atharva Samhita published with the Bhasya of Sayana from Vedic Sodha Samsthana, Sadhu Asrama Hosiarapura, Punjab. 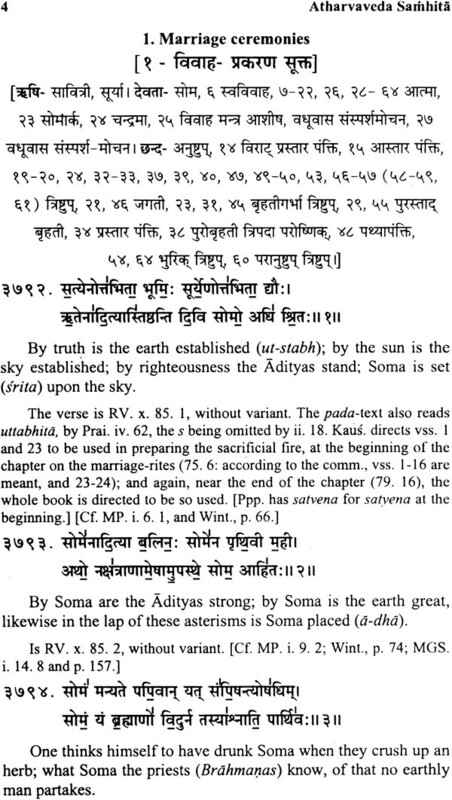 The Atharva Samhita published from Sanatana Dharma Yantralaya Moradabad in 1929 also contains 759 Suktas. Following the same trend, present Samhita also bears 759 suktas. 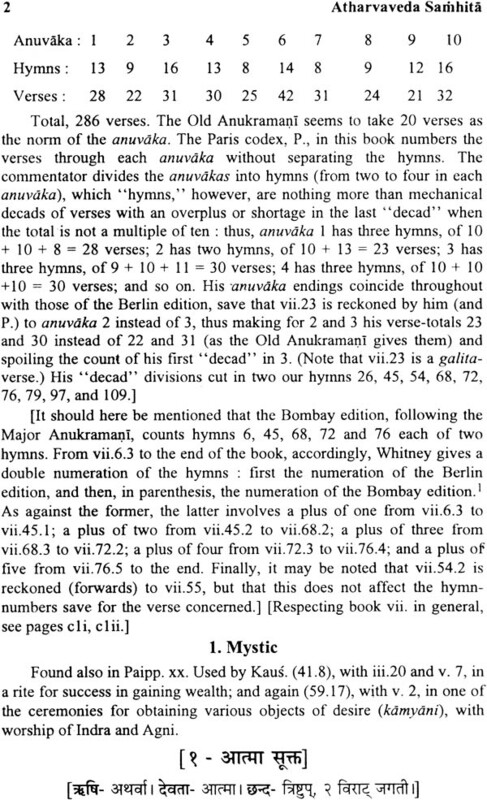 Generally it has been stated that the Atharvaveda contains as much as 6000 hymns while Whitney states the number of hymns 5038. A few Samhitas contain 5987 hymns but there are only 5977 hymns in the prevalent Samhita. This Samhita is specially in vogue in South India. The Bhasya of Acarya Sayana too is available in this Samhita. Apart from the above said two main Samhitas, the other seven Samhitas are for name sake. Some references of Mauda Samhita have been given in Mahabhasya (4.1.86) and Sahara Bhasya (1.1.30). Atharva Parisista it has been mentioned that the persons belonging to Mauda and Jalada Branches should not be made priest. Doubts of nations’ destruction has been raised if such persons are made priest (Purohita). Some information regarding Carana Vaidya. 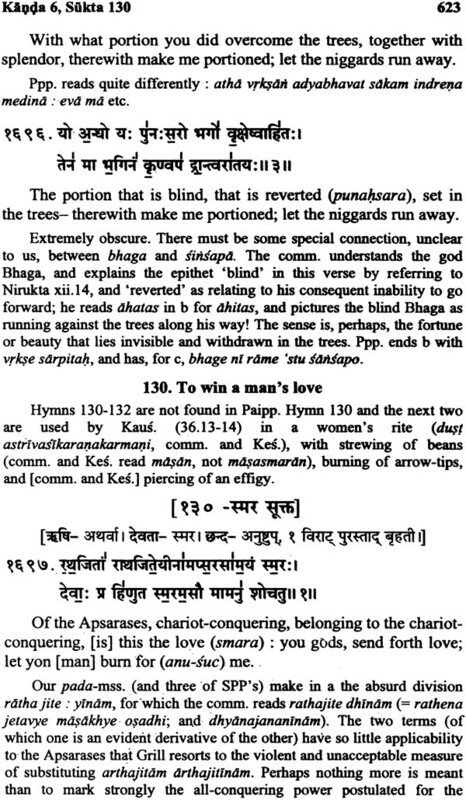 The last branch of Atharva is available from the explanation of Kausika Sutra (6.37) and Atharva Parisista (22.2). As per Vayu Purana. There were 6026 hymns in this Samhita but no copy of this Samhita is available. Other branches like Tauda, Jajala, Brahmavada and Devadarsa are in vogue for name sake and no authoritative information is available on them. (B) Upanisads – 1. Prasna 2. Mundaka. 3. Mandukya. 4. Atharvasiras, 5. Atharvasikha 6. Brhat Jabala 7. Nrsimha Tapani, 8. Narad – Paribrajaka, 9. Sita, 10. Sarabha 11. Mahanarayana, 12. Ramarahasya, 13. Ramatapani, 14. Sandilya, 15. Paramahansa Paribrajaka, 16. Annapurna, 17, Surya, 18. Atman, 19. Pasupata, 20. Parabrahma, 21. Tripuratapani, 22. Daivi, 23. Bhavana, 24. Brahma, 25. Jabala, 26. Ganapati, 27. Mahavakya, 28. Gopalatapani. 29. Krsna, 30. Hayagriva, 31. Dattatreya and 32. Garuda. (G) Anukramani etc. – 1. Atharva Parisista, 2. Carana Vyuha, 3. Pancapatlika, 4. Dantyaustha Vidhi, 5. Brhatsarvanukramani, 6. Naksatrakalpa, 7. Angirasa – kalpa, 8. Santikalpa, 9. 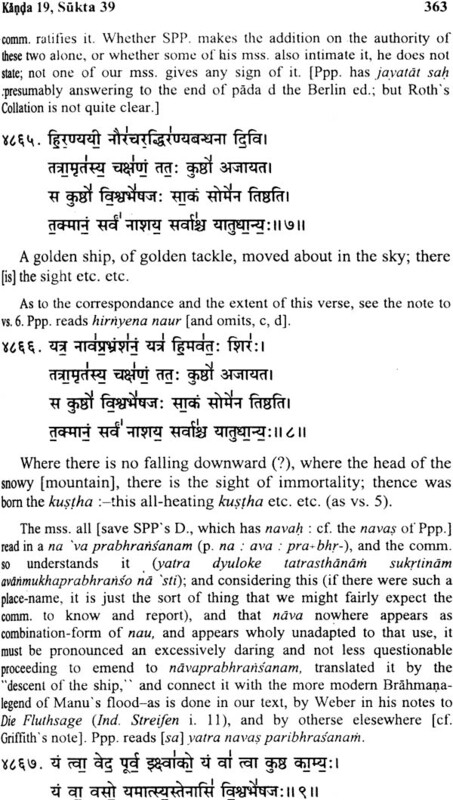 Caranavyuha Sutra, 10. Atharvaprayascitta. (H) Upaveda – 1. Sarpaveda, 2. Pisacaveda, 3 Asura Veda, 4. Itihasa Veda, 5. Purana Veda. 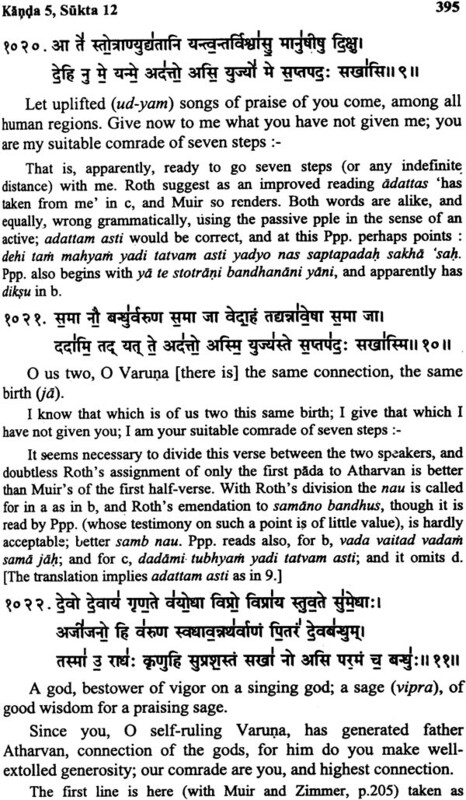 The commentators on Atharvaveda can be classified in two divisions – 1. Ancient, 2. Modern. 1. 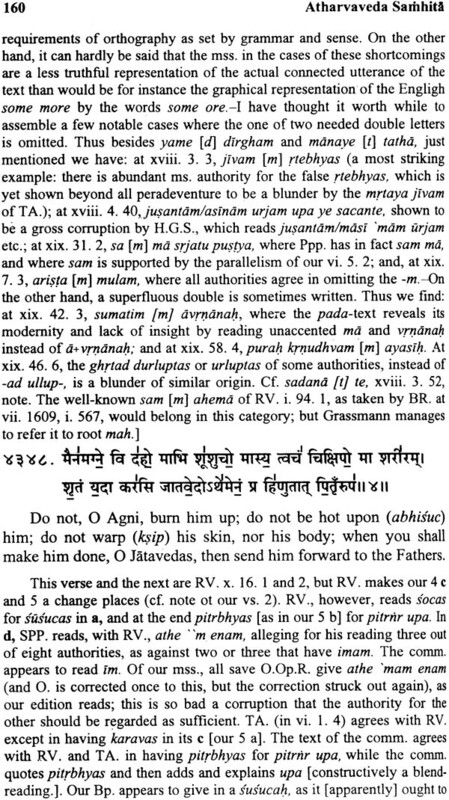 Sayana – Among the ancient commentators on Atharva Veda, the only commentary available and it also two third parts only pertains to Commentator Acarya Sayana of fourteenth century. One third part of this commentary is still out of sight. The Kandas without commentary are 5, 9, 10, 12, 13, 14, 15, and 16 ‘Kandas. Apart from it, commentary of Sayana is partially available on Kandas eighth and twentieth. 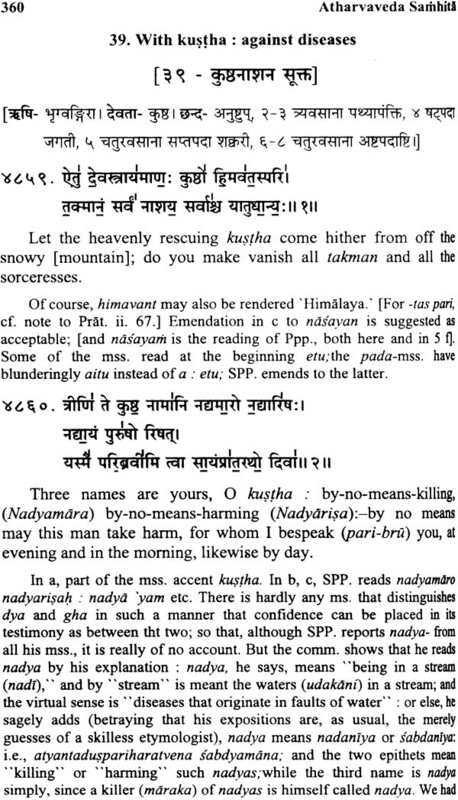 There are three Samhitas so far published on the basis of Sayana commentary. These are – 1. Nirnaya Sagar Press, compiled by Late Shri Samkara Panduranga Pandit, 1895 – 98 2. Sanatana Dharma Yantralaya. Moradabada (U.P) Compiled by Sri Ramacandra Sarma in 1929 and 3. Visvesvarananda Vaidika Sodha Samsthana. Hosiarapura (Punjab), compiled by Sri Visabandhu in 1960 – 64. 1. R.T.H. 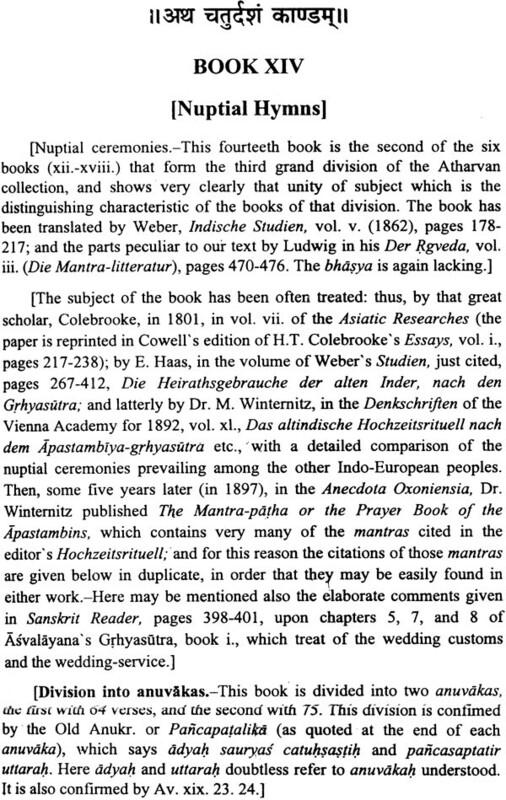 Griffith had published a translating of entire Atharvaveda in English with two parts during 1895 – 96. 2. William Dwight Whitney; It was published under Harvard Oriental Series. 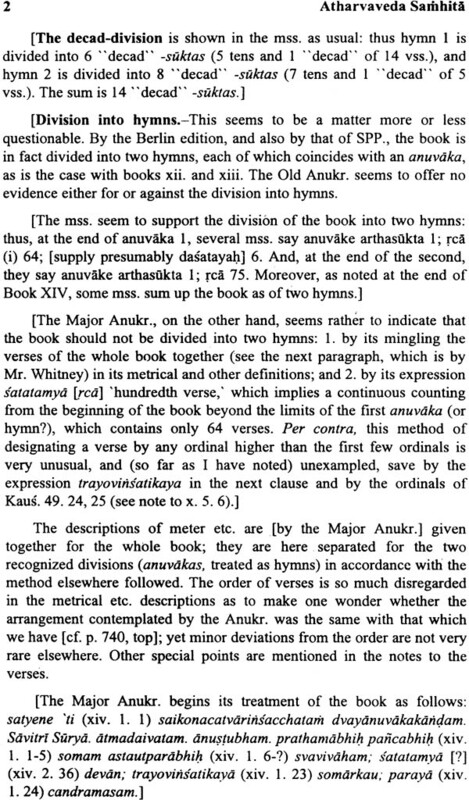 The entire subject – matter on Atharvaeda was translated with critical and exegetical commentary by W.D. Whitney in English and it was edited by Charles Rockwell Lanman during 1905. Our translation is also based on this edition. 3. Bloomfield: A substantial part of Atharvaveda was translated into English by M.Bloomfield. It was published under the series of sacred books of the east, edited by Max – Muller. 4. Ludwig – Atharvaeda was translated in German by A. Ludwig and J. Grill. Besides of this, Weber’’s translation also available on single books. The concept of Rsi. 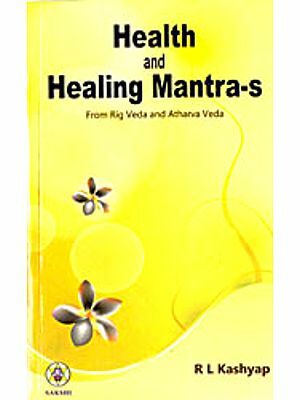 God and Chandas in opening the meanings of Vedas has an important role. It will be appropriate to keep an eye on the particularity of Rsi, god and Chandas of Atharva Veda. Rsi - The Rsi of a majority of suktas in Atharva Veda are Atharva (i.e. intelligence undeviated). 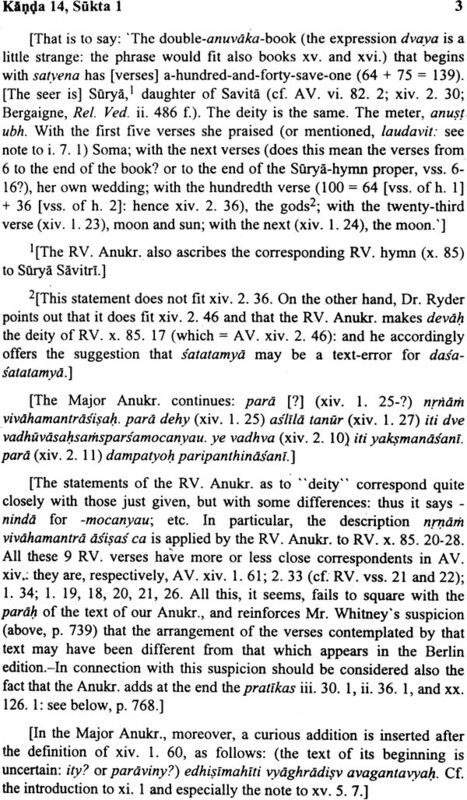 The name of Atharva is added with the Rsis of other several suktas. For example- Atharvacarya, Atharvakrti. Atharvangira. Bhrgvangira, Brahma etc. 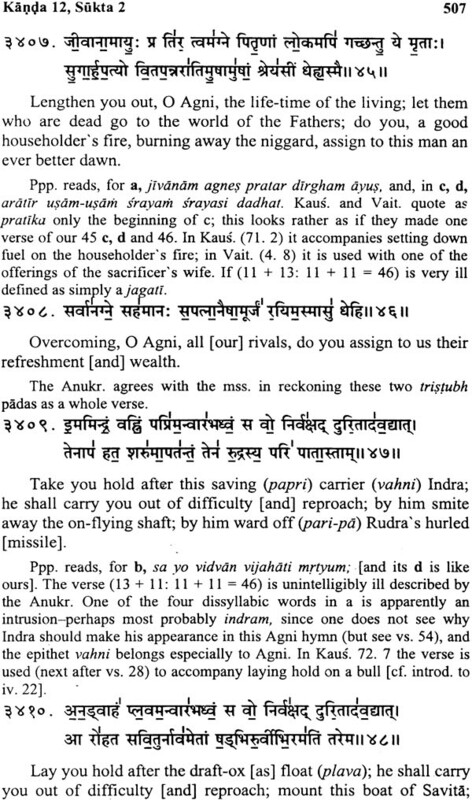 Among Rsis of Atharva Veda, there are several such names, which are not personal but abstractional i.e. intangible. For example – Narayana, Brahma, Bhuvana Sadhana, Bharga, Ayu, Yaksmanasa, Surya, Savirtri etc. It is clear that the scholar who first got the hymns, treated the conscious as Ysi and not himself. It is perhaps the conscious streams appeared them as a living person. God - The number of gods in Atharvaeda is more then double than other Vedas. It is so because its topics worth description are in considerable number and to whom the hymn is targeted is called god. 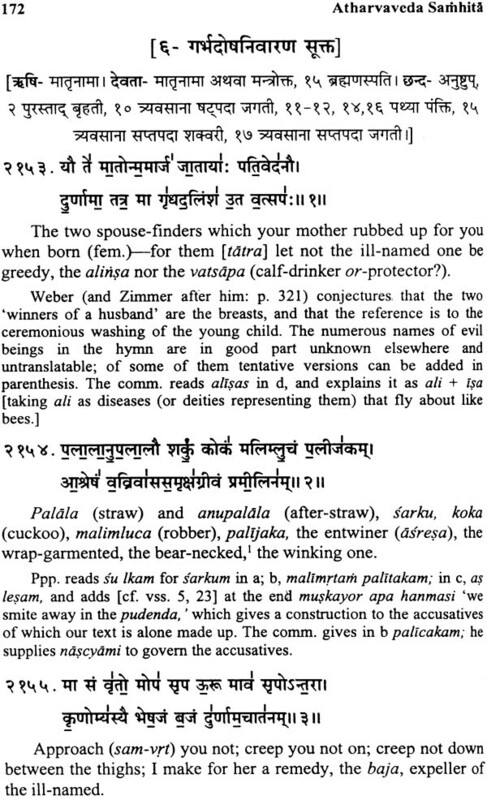 Its being in abstract from is common, but an address to gods in Atharva Veda are someway strange. For example Aja (Ajanma), Matrnama, Irsyopanayana, Yaksmanasana, Krtyadusana, Kalatma, Kamatma etc. Chanda - There is more diversity of Chandas in Atharvaeda than other Vedas. There are several Chandas about which nothing is written in the available volumes of the rhythemology. A few chandas are composed by adding with several chandas. Probably, the Rsi will have felt it necessary for his efficient expression. In Kuntapa Sukta (Kanda 20 su. 129) bears the parts of hymns and only one word hymns are found in somewhat places. They cannot be taken in any settled streams of the chandas and to understand their meaning too is difficult. The mantras of the Atharvaeda exhibit a different style of expression in accordance to the contents. The Sutra text of Atharvaeda is the Kausika Sutra. Special applications of hymns has been described therein. 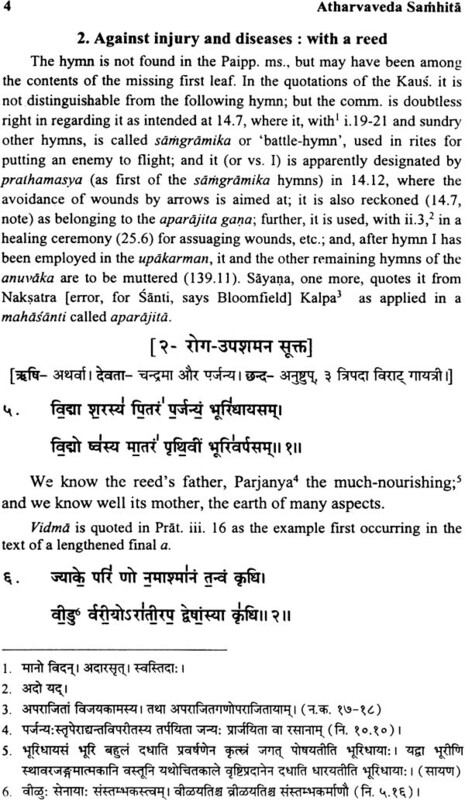 Acarya Sayana puts the meanings of hymns on the basis of their applications as described in Kausika Sutra. Hymns of Vedas are of multi – meanings because the learned seers have tried their best to explain the cryptic mysteries through application of figure of speech, by taking illustration of the formidable things or the processes. It is however difficult to understand properly the illustrations refereed by so brilliant seers and it becomes more difficult when style of language meaning is resorted. However, it can be said the grace of Vedas that enough comments/notes are given wherever the crux to understand the language expressed through gemical saying in easier way. Thus the Mantras of the Atharvaeda deal with blessing, harming and curing in the specific poetic tone. Gems (Mani): The use of several types of gems and their importance has been described in number of suktas in Athara Veda. References are found at several places regarding processing of gems, its receipt and method of holding on body. An address of gem has been applied in wide meanings in Veda. These can be made powerful through spell of respective hymns but some gems automatically hold divine powers. In Atharvaeda the terms Sraktyamani (8.5.3.) and Trisandhya Mani etc. are used for the gems,. Which are in the form of power seed. An effort to explain the hymn with their feature has been made wherever the of gems are given. Matrnama: Matrnama has been described in Sukta 4.20 in the form of Rsi and god. Some Acaryas have added this name with the Trisandhya and Sadampuspa gems. The benevolent/energizing medicines can be said as Matrnama (i.e. impressive as mother). However is appears good to treat them as the divine flow of mother entity on the basis of their effect as described in several hymns. The meaning of hymn are naturally understood on the basis of this concept. Krtyadusana: This name is used as the god of several suktas. Krtya – dusana or the experiments to set – aside either the effect of Krtya or the Krtya itself has been described at several places. The term “Krtya” is meant by a function worth doing and” Krtya – dusana” is meant by a reaction for the action done. The use of term “Krtya” in this sense can be made in good and bad both meanings. However, the use of word “Krtya” is exclusively made in the form of murdering power since beginning. Operation of Krtya is made for destruction of enemy but such acts made with resolution to destroy not only give favourable but also some undesirable results also. For example- The sea was churned with a resolution to obtain gems but there also appeared he poison. On one side, the factories provide the humanity with comfortable goods but they generate the pollution on the other. In order to develop the resolution of work and power to act; the body, sensory organs and desires are necessary to be with the man. Sometimes, these means act otherwise too and at this stage, these can be said as Krtya. The sensuality provided for reproduction is sometime misused and called Krtya. Thus. Uncountable forms ths formidable and arisen Krtya or Krtyadusana becomes necessary. The meanings of Vedic hymns can be made ex – facie when resolution of Krtya is taken in such wide description. It is not good to confine it to the practices traditionally accepted. Hence, coincide the Vedic tradition, broad applications have been embedded in this volume. Brahmajaya - A god Brahmajaya has been described in, %thara. 5.17. Jaya is meant by the wife. Its meaning as wife of Brahma or the wife of a brahmana is not relevant here as it cannot clear the connotation. If it is understood as Brahmavidya. It the traditional meaning of the other. Brahmagavi: A majority of scholars construe it as the cow of brahmana. This word has been appeared as god in sukta 5.18. The obeisance for cow and a step to increase their importance, the abnormal effects described in hymns is added with the cow but this meaning does not explain clearly the inherent sense. It is the loyal tendency of he cow of a brahmana who provides him maintenance. Hence right meaning to this term will be the profession of a Brahmana. It is hoped that the meanings to the terms “Sataudana gau, Vasa gau, Skambha etc. as given in this book by due study and taking in tradition as well will not only satisfy but also provide a new outlook to the readers. The application of figure of speech ha been made easy through the comments/notes inserted in the middle of hymns. For example – In Atharva. 4.7.3, The patient has been suggested that he should eat Karambha (mixture of medicated foodstuff) and the use of Pivapaka (to cook lipid) method will save him from the poisonous effect. This explanation of cooking the lipid is necessary to be here otherwise any person not understood it properly map cook the lipid and prepare its mixture for effacing the effect of poison. 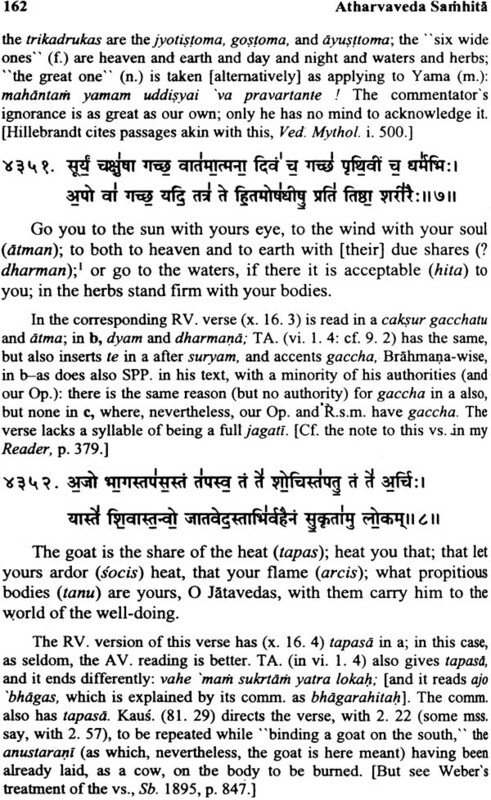 Generally, all Vedas are cryptic and it is must difficult to understand properly the senses conveyed by them yet other Vedas except Atharvaeda only can be partially understood on the basis of their language. Atharva holds a number of events full of mystery and misconceptions arise due to not understanding them properly. Misconception of Magic: A number of mysterious applications have been mentioned in Atharvaeda for avoiding from the hurdles and suppression of the wicked. Some foreigner therefore, allege that it contains the magic while a few others allege that it holds the meanful activities that throw others in adversities. However all such allegations are proved meaningless when a wise analysis is made. All people are known to this fact very well that there are all types of good and bad people and the formidable as also. Micro flows of positive and negative effects are existed. To make oneself competent and politic by observance of the etiquette and to defend from the evil tendencies and evil acts are equally necessary. Along with application of self defending measures, sometimes one has to resort the aggressive efforts also. In order to relieve from the disease, one has to resort the preventive measures and a strong blow on disease with equal force. The wit too becomes conspiracy if not used properly while a hate too protects from the evils if utilised properly. Hence, the efforts killing the defects and distorted processes can not be addressed as a mean process. Such learning is also worth use in regular intervals. Magic is nothing else than indicative of our ignorance. There are several people who exhibit a number of scientific phenomenons and the skill of their trickly hands. The people who understand it, appreciate them as skill and expert processes but the rest of people say them as skill and expert processes but the rest of people say them as magic. The term “magic” is not always used in wrong senses. There are a number of hymns in Atharvaeda whose meanings and objectives become clear but the words used there have meanings difficult to find. Yaska in his Nirukta too keeps a mum in this matter. For example, it has been very clearly stated that Tabuva and Tastuva has destroyed the poison of snake but what are these things is still unknown even to the commentators. A certain other words are – Khrgala. Visapha. Kabava. Karsapha etc. The medicines to application of medicines are not mentioned in any of the book on pharmaceutical. In same manner, what are the Jangida Mani, Pratisaramani, Astrtamani etc, which are used for protection and killing of enemies, Sayana here explains it as Aushadhivishesh only. The implied and ornamented vocabulary like – Kokayatu (sensuous tendency like Cakravaka bird), Surpayatu (Vanity like Garuda), Svayatu (enimity with clan like dog) etc. have been explained at the spot in parenthesis. The first book is made up mostly of hymns of 4 verses each, and no other ground of its existence as a book needs to be sought. It contains 30 such hymns, but also one (34) of 5 verses, two (II and 29) of 6 verses, one (7) of 7, and one (3) of 9. There are conjectural reasons to be give in more than one of these cases for the exceptional length. 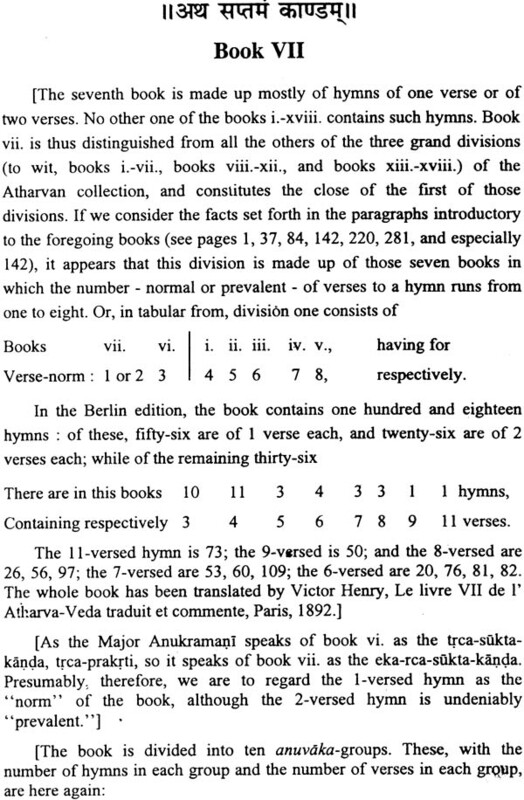 Hymns of 4 verses are also found in books vi. And vii. (12 in vi., and II in vii. ), also 9 in xix. The whole book has been translated by Weber, Indische Studien, vol. iv. (1858), pages 393 – 430. The seventh book is made up mostly of hymns of one verse or of two verses. No other one of the books i.-xviii. Contains such hymns. Book vii. Is thus distinguished from all the others of the three grand divisions (to wit, books i.-vii., books viii. – xii, and book xiii. –xviii.) of the Atharvan collection and constitutes of the close of the first of those divisions. If we consider the facts set forth forth in the paragraphs introductory to the foregoing books (see pages 1, 37, 84, 142, 220, 281, and especially 142), it appears that this division is made up of those seven books in which the number – normal or prevalent – of verses to a hymsn runs from one to eight. Nuptial ceremonies – This fourteenth book is the second of the six books (xii – xviii.) that form the third grand division of the Atharvan collection, and shows very clearly that unity of subject which is the distinguishing characteristic of the books of that division. The book has been translated by Weber, Indische Studien, vol. v. (1862), pages 178 – 217; and the parts peculiar to our text by Ludwig in his Der Rgveda, vol. iii. (Die Mantra – literature), pages 470 – 476. The bhasya is again lacking.